BRAINWASH MACHINE or, How I Learned To Stop Thinking And Love The Label, is an exploration in dance, big data, IOT, and audience participatory installation, of how labels frame thought and shapes judgment in modern life. This performances was part of the Can We Design Freedom? event at YBCA. MESH is Kinetech Arts newest work, which is being currently developed during Combustible Residency at CounterPulse Theater. 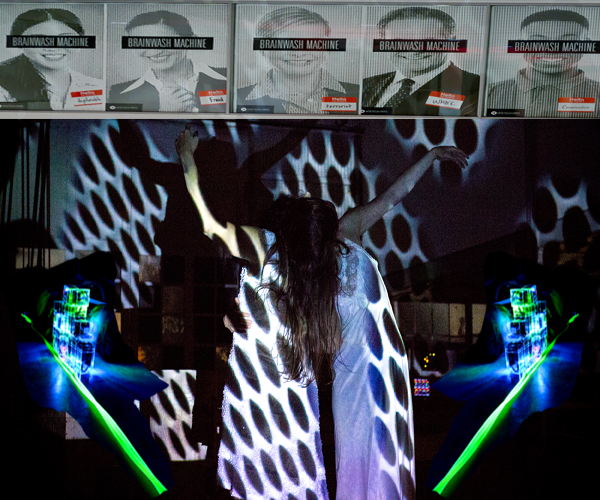 In MESH, Kinetech explore a complex network of physical limitations and human connections through data and dance, projection mapping and motion capture. Weidong Yang, co-founder of Kinetech Arts, is a scientist, dancer, photographer, and Taiji practitioner. Born in China and educated in the US, he works to synthesize his background in technology and art into new forms of expression. In addition to his work with Kinetech Arts, Weidong is CEO of Kineviz, a data visualization company he founded in 2014. He was a resident scientist at Djerassi in 2016. Daiane Lopes da Silva, co-founder and artistic director of Kinetech Arts, is a dancer, educator, and choreographer whose work has been performed in Brazil, France, Belgium and the U.S.A. She has worked with Lisbon Dance Company, Labayen Dance, KUNST-STOFF Dance Company, Robert Moses' Kin, Little Seismic Dance Company, among others. Her residencies include RAW, RAD, and Marin Headlands Center for the Arts. In 2013 she graduated with a B.A. in Psychology from SFSU. Scott Kildall - What Does Data Look (or Sound) Like? Scott has been focusing on making physical data installations for the last few years. In the first half of his talk, he will be showing his open-source toolkit to build "Data Crystals". Using OpenFrameworks, his code will map any geolocated data in 3D space and use clustering algorithms to make digital "gems" which can then be 3D printed. For the second part of his talk, he will show a new work, Sonaqua which sonifies water samples as an autonomous installation using simple, decentralized Arduino circuits. Scott Kildall is a new media artist and researcher who writes algorithms that transform various datasets into 3D sculptures and installations. The question that drives his work is: what does data look (or sound) like? He often collaborates with scientists with a focus on data about water. He is currently an artist-in-residence at the SETI Institute. Therrien is currently working on ARTIFICIAL SUN #7 from his ARTIFICIAL SUN series of light sculptures, first prototyped in the mid 1980s and resurrected in 2010 to address issues of climate change and geo-engineering. He is proposing large scale audience interactive versions of the ARTIFICIAL SUN for temporary and permanent installation in various cold weather cities around the world. 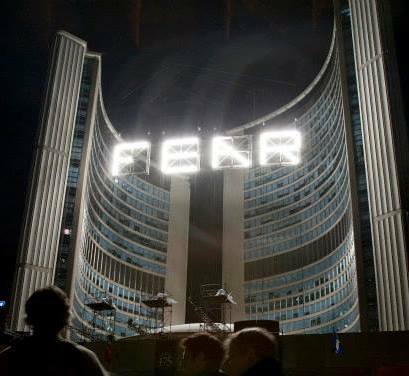 Therrien's most recent large scale installation, Beautiful Light: 4 LETTER WORD MACHINE, a 1,000,000 watt 16,000 lb interactive light sculpture was suspended between Toronto City Hall towers for Nuit Blanche 2009. He will also briefly talk about his earth-to-space light and satellite projects, as well as his ARTcon container studio projects in LA and Phoenix. D.A. Therrien is an award winning trans-disciplinary artist that works at the intersection of technology and the human body, presenting large scale ritualistic electro-mechanical spectacles of body and machine in Europe, Asia and North America since 1983. His work utilizes machines, information displays, high intensity light, physiological monitoring and live electricity in complex interactions with human performers/operators/audience. Making LED sculpture has never been easier! There are lots of LED chips, LED controllers, and LED client apps. Unfortunately, many choices often accompany confusion. Christopher Schardt used to be a programmer who made large-scale art for fun. Now he's an artist writes code for fun (and art). 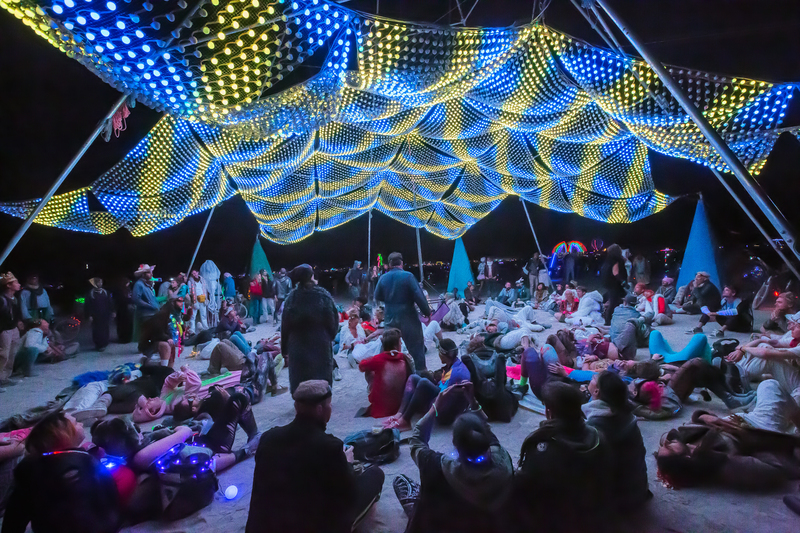 He's best known for Firmament, a 52' diameter canopy of 21,600 LED modules seen at Burning Man 2015/2016, and several other events. This piece was recently named one of the 50 best public art pieces in 2016 by Americans for the Arts. He programs in Objective-C and C++, mostly for iOS but recently for Raspberry Pi too. (He sure wishes Raspberry Pi had an OSX-based IDE.) He's written a number of iOS apps, including LED Lab, Moe's Notes, and Moe's Notepad. He also wrote MS-DOS apps way back when. Remember Banner Mania? Print Artist?